"Constructed for stability at a time when reconnaisance was considered one of the most important roles in aviation, the BE2 was a two-seater which became one of the longest serving and multi-functional aircraft of the first world war." Reviled by many for its rear-placed pilot's cockpit, limited gunners space and engine problems, the BE2 was used for anything from artillery spotting to reconnaisance, bombing missions, anti-zeppelin attacks and transport. At least eight variants were created which increased the aircraft's longevity and resulted in a continuation of aircraft design that enabled the series to evolve in stability, performance and role. These include the BE2, the BE2a, 2b, 2c, 2d, 2e, 2f and 2g. The birth of the BE2 aircraft in Britain came from the BE1 which was developed out of a series of reconstruction and repairs to damaged Bleriots and Voisons between 1909 and 1913 by test pilot and designer Geoffrey de Havilland and his chief F.M Green. The BE1 or "Bleriot Experimental" (named in reference to Louis Bleriot) is of great historical importance as it was the first aircraft to be specifically designed for military use. It made its first flight in early December 1911 and was quickly nicknamed "the silent aircraft" due to its surprising lack of noise in the air. With the test program that followed, the BE1 went through a series of design changes and modifications which resulted in the Royal Flying Corps giving permission to the Army Aircraft Factory to construct a new variant based on the knowledge attained. This became the BE2. Apart from the power plant, the BE2 was hardly different from the BE1. A 70hp Renault in-line engine was fitted to replace to the 60hp version, and upon its first test flight on the 1st of February 1912, its improved performance in takeoff and climb were immediately noticed. Within a couple of months the model was modified to take one of the first airborne radio transmitters and was used to control the first artillery shoot corrected from the air in an exercise at the Salisbury Plain. Although produced by the Royal Aircraft Factory, the majority of BE2's were made by private contractors which led to the RAF being able to concentrate on the development of other aircraft. The BE2 was capable of reaching 10,560 feet and could carry a load of 450 pounds. It could climb to 10,000 feet at a rate of 365 feet per minute and could reach speeds of 70mph. Believed to be the first RAF aircraft to land in France in 1914 in support of the BEF (British Expeditionary Force) the BE2a was the subject of a number of experiments and was markedly different to the BE1 and BE2. It's wingspan was unequal with the upper wing being slighter longer and the fuel system was revised with the external fuel tank on the upper wing removed and the exhaust pipes extended along the fuselage. A short decking was also fitted to the fuselage directly behind the engine which offered protection to the front cockpit. Other modifications were trialed such as an oleo type undercarriage and stabilizers (or fins) were mounted above the upper wing center section and a long span horizontal stabilizer. The wingspan was also later changed back to the original design of equal length. The next variant appeared in early 1914 and was designated the BE2b. These became the main aircraft of the RFC that flew to France from Swingate Downs, Dover after the declaration of war against Germany. Little was noticeable in design between the BE2a and the BE2b. Externally, there was a revised decking arrangement on the fuselage around the cockpits and internally, a new control layout and fuel system. The BE2b became a part of war-time legend when 2nd Lt. William B. Rhodes Moorhouse became the first to be awarded the Victoria Cross for aerial action. Moorhouse conducted a bombing raid against the railway outside the Courtrai Station armed with a single 112 pound bomb. He descended to 300 feet to ensure accuracy against the narrow railway which presented the BE2b as an easy target for rifle fire from the ground and nearby buildings. Moorhouse was fatally wounded in the stomach, hand and thigh and his aircraft was also severely splintered by his own exploding bomb (ninety-five holes were later counted) He flew for some forty minutes back to his base at Merville and after making his report, died the next day in hospital. 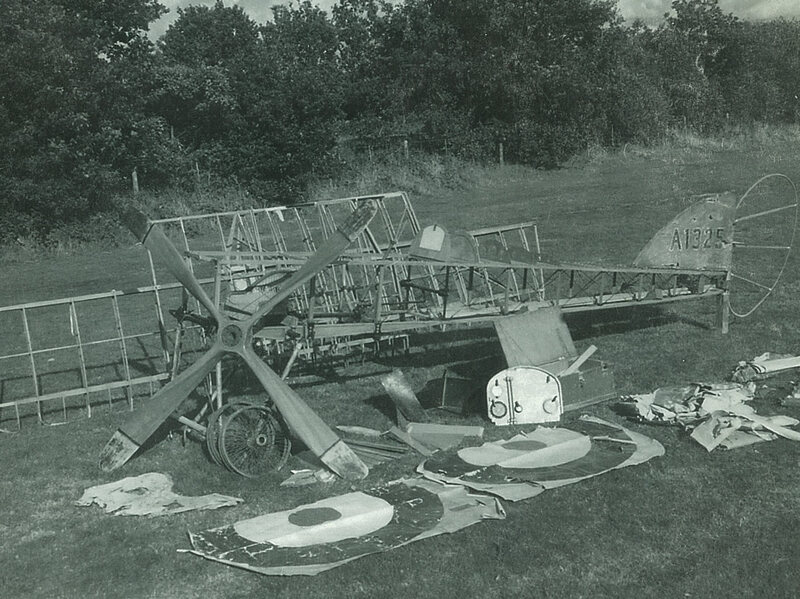 Captured intact BE2s were carefully examined by German and Austrian forces for their design and modifications. Produced in greater numbers than any other of its type, the BE2c introduced several new features to the basic design, leading to a more reliable and stable aircraft for its intended role of visual reconnaisance which included a mounted camera. A triangular vertical fin was added ahead of the rudder (later increased in area and rounded at the top) and the rounded horizontal stabilizer was replaced with a rectangular tailplane. The first BE2cs kept the undercarriage skids but these were quickly replaced with various types of oleo main landing gear. The main innovation to the 2c was the use of staggered wings and true ailerons installed on both the upper and lower wings. The ailerons replaced the earlier wing-warping controls used on the 2a and the 2b. Although never intended for armour, as the war escalated the BE2c carried a variety of weapons and soon found a role as a light-medium bomber. Most of the two-seat aircraft carried a single mounted Lewis Gun for the observer in the front cockpit mounted on pipes designed by Capt. L.A Strange. These became known as "Strange Mounts" and were often in place in different locations. "Candlestick" mounts were also positioned in different locations on the fuselage so that the gun operator could change mounts during flight to meet the direction of the threat.A single-seat BE2c was also manufactured as a bomber (later to become the version used as the BE12 with a more powerful 150hp RAF engine) and its stability in the air suited this role well. A fixed firing Lewis Gun on the upper wing was mounted and bomb loads usually consisted of single or dual racks of 112 pounders under the wings, close to the fuselage. A number of BE2cs were also modified to carry Le Prieur rockets for anti-zeppelin missions (balloons were successfully destroyed but never zeppelins by these highly inaccurate rockets) Normally, five rockets were attached to each of the outboard interplane struts. Various engines were fitted to the BE2c, the most common being the 90hp RAF la. 105hp RAF lb and ld were also used along with the 70hp Renault, Several types of Hispano-Suiza engines and the 90hp Curtiss OX-5. The Curtiss engines were fitted to some 300 BE2cs that were delivered to the Royal Naval Air Service and used for bombing, submarine patrol and flight training. It was during the BE2c's service on the Western Front that its future became precarious. With the rise of the Fokker monoplanes, the BE2c became a favourite target and although it was not shot down in great numbers when compared with other aircraft statistics, the BE2c was considered a fatal liability with its rear-placed pilot and limited maneuverability both aerodynamically and for the gunner. Armament:1-4 Lewis .303 Machine Guns. 2 x 112 pound bombs (flown solo), 10 (max) Le Prieur Rockets. The BE2d differed externally in that it had a small external mounted gravity tank under the upper port wing. The tank was connected to an internal fuel tank in the fuselage to the rear of the pilot's cockpit. The forward cockpit of the BE2d was different in shape with the side panels cut lower. Dual controls were another feature of this variant and although equal wing span was originally intended, a shorter lower wing span was created during production. Produced by companies such as Vulcan, Ruston, Proctor and The British and Colonial Aeroplane Company (later to be named Bristol) very few of the BE2d actually featured in action against the enemy, most being used as trainers either in Britain or France. A number were modified, in factories or at squadron level and given BE2e type wings and tailplanes. The standard engine for the BE2d was a 90hp RAF engine but many other types were fitted during its production. It is widely reported that the BE2d gained a miserable reputation amongst pilots for being structurally weak and breaking under the strain of violent maneuvers. This continued to haunt the BE2 series despite there being no real proof of its frailty. The RAF tried to improve the performance of the depressingly unmilitary BE2c and 2d in minor ways and this resulted in the BE2e. Wings of unequal span were again fitted with only one pair of interplane struts on either side and long extensions to the upper wings were braced by stream-line section wires. Landing loads were taken by overwing wires connected to inverted 'V' king-posts. Like the BE2d, it had dual controls which made it handy for flight training and a revised fuel system. A part of the new design featured horizontal tail surfaces with raked tips and a reduced area, coupled with an enlarged fin and rounded leading edge. Several different types of engine were fitted to the BE2e including the 75hp Rolls Royce Hawk, 150hp Hispano-Suiza and at least one 90hp Curtiss OX. The BE2e was fully converted by February 14, 1916 and submitted to the Aircraft Inspection Department for final approval. It was first test-flown on February 18. With the hopes that the performance of the BE2e in altitude would be boosted, the new configurations were moderately successful, nothing was done however, to provide the aircraft with more effective armament. It was decided late in October 1916 that only BE2es would be sent to the RFC in France and this saw them in service large-scale as a part of reconnaissance and artillery spotting squadrons. Up against the newer and better armed German planes, the BE2e's losses continued to be heavy. Despite being easy prey for the Luftstreikrafte, the BE2e was purchased by the Russian Government, the United States Air Service and was also used by Estonia, Norway, Australia, South Africa and Greece. To meet the demand for more BE2e aircraft, the RFC began to modify earlier BE2c and BE2d models. Due to problems with the supply of spare parts and maintenance of the hybrid aircraft, and instruction was issued in October 1916 that modified BE2c aircraft would be redesignated as the BE2f and rebuilt BE2d's would be redesignated as then BE2g. Externally, the only way to tell them apart was by serial number. In all just over 3,500 of the BE2 series were produced with precious few of the originals surving in this day and age.